It is time to follow up on the one meeting we had on the day Netayahu inaugurated the 18 Knesset. You told our committee about your meeting with Rabbi Israel Ber Odesser and how as a member of the opposition, you could not influence this issue. That was probably true then, but right now for two weeks, you can wield an enormous amount of influence regarding this issue on Yair Lapid. For your convenience, I put some information below. Vice President of the committee. Our committee believes you are the only one who can immediately understand the importance of bringing this letter to Yair Lapid, now, before the coalition is formed. We believe that this project will give Netanyahu the proof that only Mr. Yair Lapid has the ability to carry it out at this critical time. Please see to it that Mr. Yair Lapid reads this letter immediately. Once the media hears about the project from him, we surely believe he will be assigned by Netanyahu to for it's execution, Netanyahu will not be able to let him down. This months letters to President Obama, President Shimon Peres, Ambassador Shapira, Justice Minister Tzipi Livni, + have been placed below for immediate use. You are the only individual that can properly unite the Jewish World behind Prime Minister Netanyahu and President Obama, no one will be able to stop you. You will succeed in creating a real and lasting revolution. The immoral side, in particular, of the "untouchable" and "vaticanised" religious parties/organisations would be hit very strongly and even shattered once Rabbi Nachman arrives. 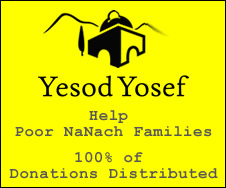 Our committee is completely at your disposal and we have no personal economic ambitions for this project, Rabbi Nachman will belong to the State of Israel once he is here. This project puts at stake an enormous amount of money for Israel and for the private sector. Ex-Prime Minister Arik Sharon has given us valuable land and a license to bury Rabbi Nachman. Late Prime Minister Issac Rabin, Ex-Prime Minister Ehud Olmert, Late President Haim Hertzog, all were stopped by Meir Porush, Agudat Israel and Arie Dhery, Shass. Thank G-d, because of you, these parties out. President Peres has been backing this project actively for the last 20 years. We believe that this project can bring Peace to the region, prosperity and happiness to the whole entire world. If this is done immediately, during the 20th of March Presidential visit of Mr. Obama to Jerusalem the major conflicts will be resolved peacefully, thanks to you. We thank you for your attention and will be happy to help in anything you want.